Strange Culture: Up In The Air: "Wish You Were Here"
Up In The Air: "Wish You Were Here"
I write this on the road. Sitting on a hotel bed after a long day of work and a late business flight last night. 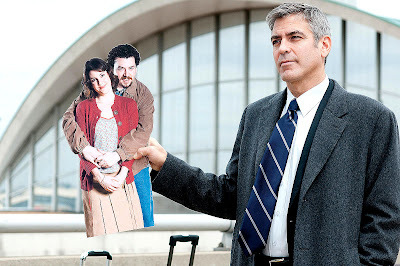 And as I walk in the airport lines...all the different lines, checking baggage, security, boarding the plane, and so forth I continually think of George Clooney and Jason Reitman's film, Up in the Air. A variety of things along the way remind me of this, including hotel reward status, and even the robe in the hotel closet. I travel independently very infrequently, but I can't imagine what it's like for people like Clooney's character Ryan Bingham who do spend a good portion of their time "Up in the Air." It's interesting because even if you put in a super full day of work on the road, you feel kind of alone. Over the holidays my wife and I traveled with a toddler which included a lot of coordination, luggage carrying, and general exhaustion. But even though it's probably easier to travel by yourself, it's hardly better. Good night friends and family, wish you were here. LP and I wish you were here too :-) See you soon! I did not like Up In the Air very much.